Studies of thermodynamics often fail to demonstrate how the mathematical intricacies of the subject relate to practical laboratory applications. Thermodynamics of Pharmaceutical Systems makes these connections clear, emphasizing specific applications to pharmaceutical systems in a study created specifically for contemporary curriculums at colleges of pharmacy. Thermodynamics need not be a mystery nor be confined to the realm of mathematical theory. 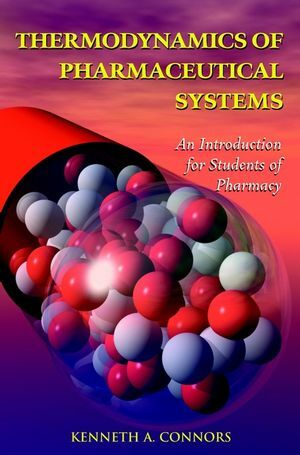 Thermodynamics of Pharmaceutical Systems introduces students of pharmacy to the profound thermodynamic applications in the laboratory while also serving as a handy resource for practicing researchers. Kenneth Connors is Professor in the School of Pharmacy at the University of Wisconsin at Madison. 1. Energy and the First Law of Thermodynamics. 1.2. The First Law of Thermodynamics. 2.2. The Second Law of Thermodynamics. 2.3. Applications of the Entropy Concept. 3.1. Properties of the Free Energy. II: THERMODYNAMICS OF PHYSICAL PROCESSES. 5. Introduction to Physical Processes. 7.3. Partitioning between Liquid Phases. 8.1. Coulombic Interaction and Ionic Dissociation. 8.2. Mean Ionic Activity and Activity Coefficient. 10.1. Solubility as an Equilibrium Constant. 10.3. Temperature Dependence of the Solubility. 10.4. Solubility of Slightly Soluble Salts. 10.5. Solubilities of Nonelectrolytes: Further Issues. III: THERMODYNAMICS OF CHEMICAL PROCESSES. 12.2. pH Dependence of Acid-Base Equilibria. 12.3. Calculation of Solution pH. 12.5. Aqueous Solubility of Weak Acids and Bases. 12.7. Acid-Base Structure and Strength. 14.4. Measurement of Binding Constants. B.3. Algebraic and Graphical Analysis. B.5. Statistical Treatment of Data.